The stadium was converted from athletics to football use after the commonwealth games in 2002. We showed each configuration in a single model. 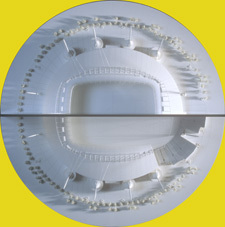 The entire stadium was viewable on each side using a custom made mirror plane that runs on the central axis.